The City Council adopted a new Housing Element on March 3, 2014. The adoption is the culmination of a six-year process including numerous meetings with the City Council, the Planning and Zoning Commission, and Albany residents. The Housing Element covers the period 2007-2014, and has been prepared in accordance with California Government Code requirements. 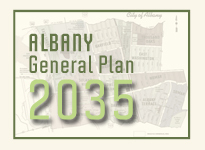 It includes goals, policies, and action programs to conserve housing, produce new market rate and affordable housing, meet Albany’s special housing needs, and ensure fair and equal access to housing. The Element identifies specific sites where the opportunity to build housing exists, and demonstrates that Albany can meet its fair share of the region’s housing needs.